Would you like an easy way to save $300 to $1000 this year for your direct sales business? In Our Story, when the founders got serious about their direct sales business they learned a very expensive lesson. They had the privilege (please read the sarcasm here) of paying the IRS thousands of dollars that they were not planning on paying. 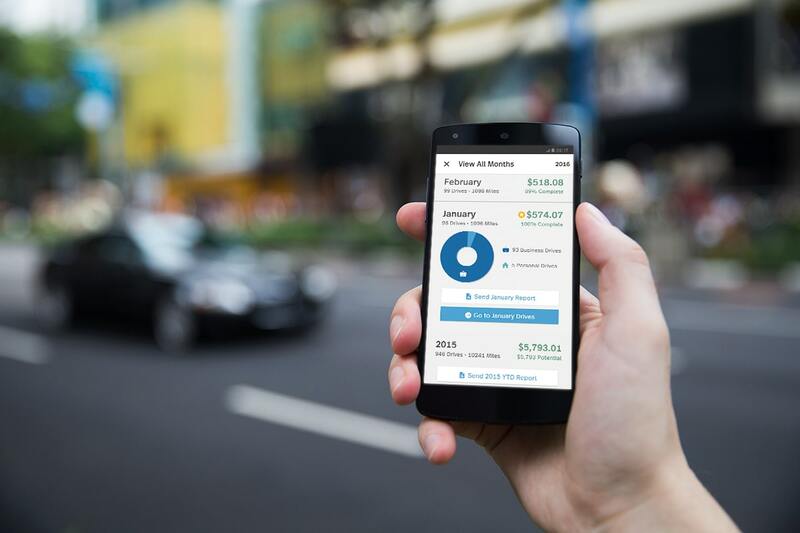 In our Direct Sales Tax Deductions article I wrote about the mileage deduction and the phone app I use to track my mileage. This article is my MileIQ Review where I discuss why I love using this app as well as how exactly it works. If you drive 20 miles each way to a home party, you can write-off $21.40 per drive from your taxes. If you have 2 parties per week for 50 weeks a year, you can write-off $2,140 per year! That saves you over $300!!! Remember you can track and deduct mileage when you drive to home parties but don’t forget about other business driving. You can also deduct mileage when you drive to pickup office supplies, deposit party checks at the bank and when you drive to the post office to mail host packets; anytime you drive anywhere for your business. The mileage deduction is often one of the largest tax deductions for a direct sales consultant, especially if you do a lot of parties and vendor events. The mileage tracking app I use and recommend is MileIQ. If you sign up from the link you will save 20% off their annual subscription plan (Full disclosure, we also receive a $25 gift card if you use the link here. This is not our goal. Our goal is to offer you the 20% discount). This tracks unlimited drives. MileIQ counts every time you drive your car anywhere as a drive so unlimited drives is a must for me. Using the 20% discount the annual plan will cost you around $48. Would you pay $48 to save $300 per year? Sounds like a no-brainer, right? My first attempt at mileage tracking for my direct sales business was using the pad of paper method. The problem I ran into was either forgetting to write a drive in the pad or hurrying with the plan to write it down after the drive and not getting around to it (read forgetting again). With the MileIQ app, it tracks every drive you make. Whether it is for work or not. After you drive anywhere, you get a reminder to classify the trip as business or personal. You simply swipe to the left or to the right and you are done! Simple! Just like our application’s philosophy! Step 1: Use the MileIQ link to save 20% on your subscription. You actually sign up free to try it with 40 drives per month and get 20% if you want to upgrade. I blew through my 40 drives quickly and upgraded. Step 2: Add your vehicle by clicking on “settings”. Then click on “Vehicles and Odometers” down the left side of the page. After that, click the green “Add New Vehicle” button and fill out the form with you vehicles information. Step 3: Next add your Custom Purposes which you will use when you classify your business drives. Click on “Custom Purposes” down the left side of the page. Under business click “Add Business Purpose.” After that add anything you want such as “Home Party”, “Vendor Event” and “Recruiting Meal”; whatever you want. Once you have your purposes you can drag them up to the top of your list to make it easier to classify on the app. The IRS requires a purpose for each business drive. Step 4: Next, you will need to download the app from your phones app store. Step 5: Log into the mobile app on your phone with the username and password you setup in step 1 above. It may prompt you to turn Drive Detection on. If so, do this to allow it to record your drives. Bonus Step: If you want to refer someone and give them 20% off and get a $25 gift card for yourself you find your link by logging into the app and selecting Refer a Friend in the menu. From there simply text or email your referral link to whomever you choose. 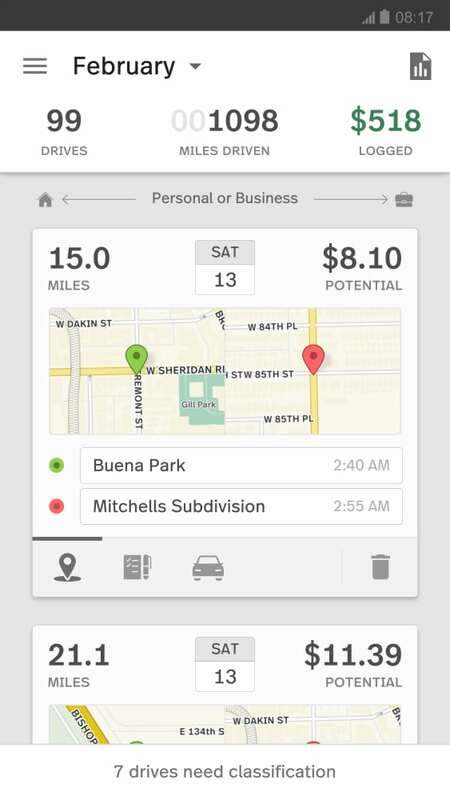 After you drive anywhere, MileIQ will remind you to classify your drive. 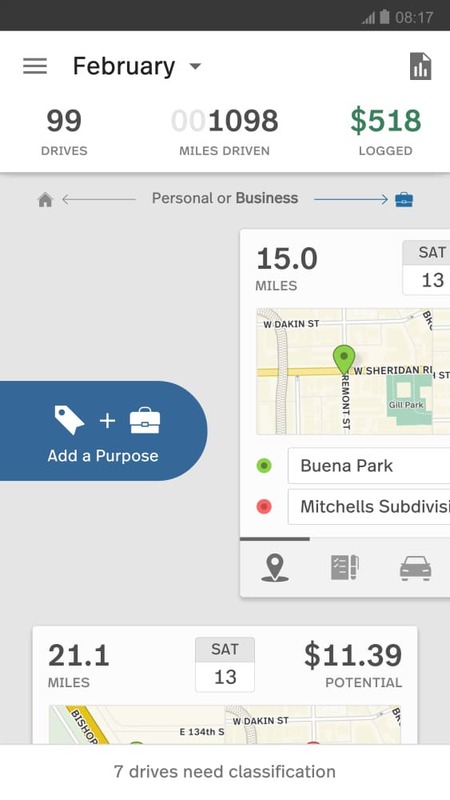 Your will see something similar to the screenshot below (left image) showing the beginning and ending maps as well as the number of miles and potential dollar amount that could be deducted for that drive. It is very simple. You drag the image to the right to classify the drive as a business drive and to the left for a personal drive. If, when you swipe, you swipe slower and pause at the end of swiping you can add your purpose that you setup previously to each drive (right image below). If you ever miss a drive (or forget your phone at home) you can add in the drive later. Just log into your dashboard and clicking the “Add a Drive” plus button at the top of the drives list. After you choose the type of drive all you have to do is enter the starting and ending addresses and click save drive. To view you MileIQ mileage report you simply have to log into your dashboard on the website, click the reports tab at the top of the page, then enter the dates for the report and click the Create this report button. You will then have access to both a csv report and a pdf report that you can download and save for your records. The last thing I do at the end of each month is add the mileage deduction to Direct Sidekick under the transactions tab. Fill in the form and click the submit button. I highly recommend tracking your mileage with an easy to use phone app for your direct sales business. It makes it simple and simple is good. Simple leads to things getting done and not being missed. As I said above tracking your mileage can be a great tax deduction for your business. Thank you for reading this MileIQ review! Please let me know your thoughts in the comment section below.